I’ve never been a fan of the God of War series, although I’ve tried several times. I’ve had all three main games at various points, and I think I still might have God of War 3 for PlayStation 4, even though I got tired of it within the first four hours. I never got into the previous games because Kratos was a shallow character. Also, the combat was dull, the quick-time events were too cumbersome, among other things. Well, this God of War has undergone a massive shift, both tonally and gameplay-wise. So how does it fair? To put it simply, it’s one of the best games of this console generation thus far. The basic plot of the story is pretty good. 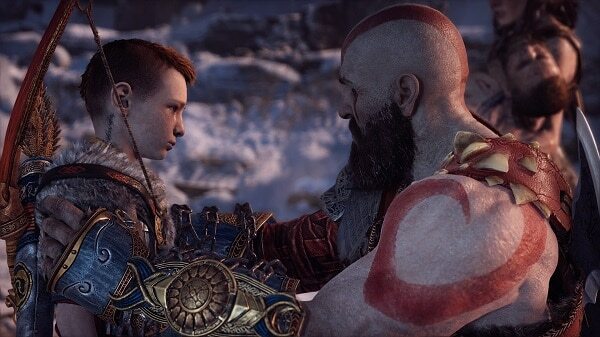 Kratos wife has recently passed and it was her last wish to have him and their son Atreus spread her ashes from the highest mountain in the land. Naturally, it’s not as easy as it sounds to get there. Kratos is soon attacked by a mysterious man, meets up with a pair of dwarven brothers who have a feud, a witch who is a healer, and the head of Mimir who you strap to your belt as your companion. I’m being a bit vague about the story intentionally. Part of the charm of this game is how it unfurls and the different motivations and reveals that happen as you play. In this respect, it’s akin to The Last of Us where some good surprises happen throughout the story. TLOU also included a pint-sized companion with you at almost all times too. 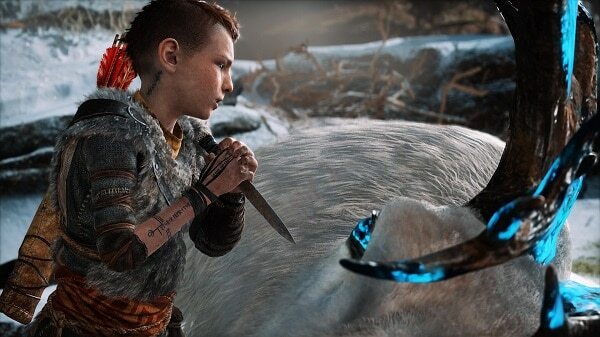 Atreus is with you throughout the game and is extremely useful from a gameplay perspective. He generally discovers side areas, treasures, hidden stuff, and is useful in combat. He primarily shoots arrows at enemies, which can either shock or stun them (when he is upgraded.) 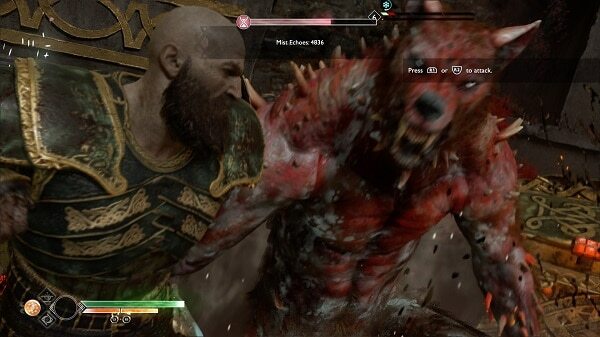 Later on, he also jumps on certain enemies, keeping them in place for Kratos to easily attack. He can technically be killed during combat. However, there is a long sequence where an enemy has to grab him and then kill him. You are also given ample time to stop this before it becomes an issue and I think during the main game it only happened once. As an actual character, Atreus is extremely well-rounded and engaging. He actually comes across as a separate person in a game, which is a real rarity. Especially, in an action game such as this. Elle, in The Last of Us, was decent, but the nature of her AI and the situations you were in always kind of broke the narrative illusion. This is not the case with Atreus. He is almost always someone you care about and is functional too. Thus, making you care even more about him. It’s funny how both this game and Assassin’s Creed Origins eschewed their prior games’ mechanics and went for something very similar to one another. The difference is, that in AC: Origins the change felt like an afterthought. While in God of War it is the reason to actually keep coming back. You control Katros with the analog stick while R1 and R2 are used for light attacks and heavy attacks, respectively. 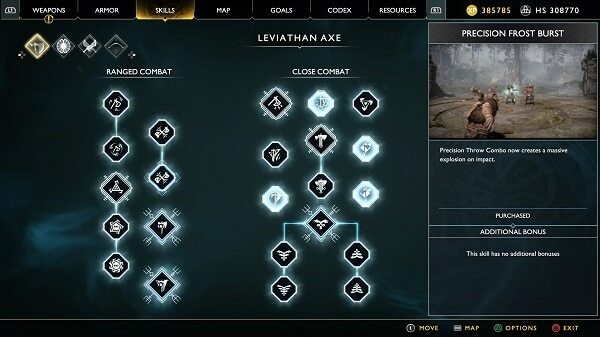 L2 is your aim button (for throwing your axe), L1 is used for guarding, X is for rolling. While square has Atreus attack. Triangle makes your axe fly back to you and circle is a general “action” button. For example, If you want to open a door or chest, or pick something up off the ground you’ll use circle. Finally, pressing down on the d-pad has Kratos do a quick-turn, very much like what you do in Resident Evil 4 in certain situations. It’s basically a 180-degree turn on the spot. One thing to note is that the camera is pretty close in on Kratos. There isn’t any sort of cinematic angles as you play, aside from a few small events. The camera is essentially locked to Kratos and seems like it is only two or three feet behind him most of the time. This does make you feel like you’re part of the action but also can create some problems later on with tougher, more nimble enemies. 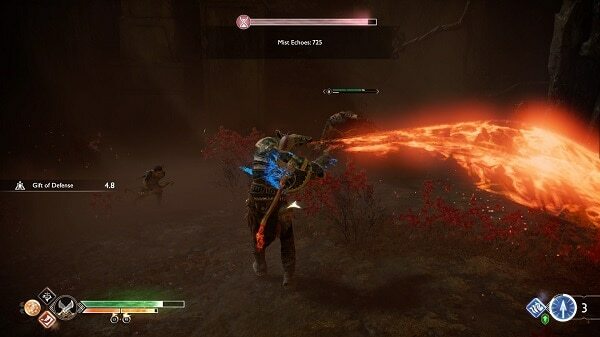 Combat in God of War is a visceral, strategic experience that is always rewarding. At the start, you do feel pretty underpowered but once you get better gear, unlock more runic attacks and unlock skills, then you can really get a grasp of the combat’s depth. One interesting system is stuns vs. damage. Your weapons (axe/chains) deal damage to an enemy’s health bar. It also generates a small amount for the stun bar, which is located under the health bar. Using your runic attacks or bare fists deals very little health damage but does deal a ton of stun damage. Once the bar is full you can press R3 to do a cinematic-style kill, where you will either kill a normal-sized enemy or else get into a grab with a larger enemy where you can repeatedly punch them. Much like the previous games, you can also enter Spartan Rage by clicking in R3 and L3 when the meter is filled. This gives you a limited period of invulnerability where if you get hit, it takes it out of the meter instead. While you’re in rage mode, you also can’t use any weapons and instead are given a different move-set with bare fists. It’s not meant to be used all the time but it is a good emergency mode to help keep you alive in sticky situations. 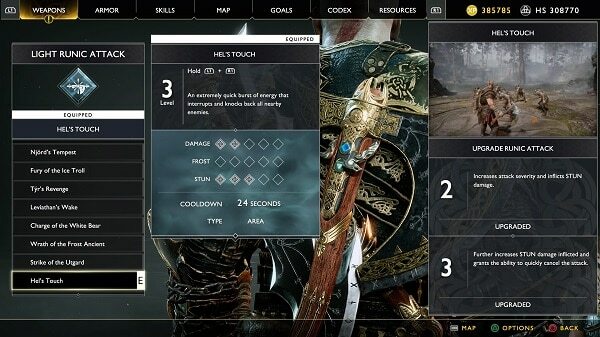 Also, like in AC: Origins, there is a level and gear system. Although much more understandable in God of War. 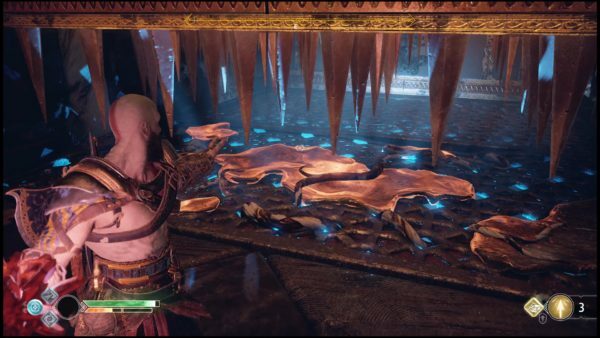 Kratos only has three weapons in the game. The axe, bare fists, and eventually the Chains of Chaos make their return. The gear comes into play with what you equip to your weapons and in armor sets as well. For the axe you can change the pommel. For the chains, you change the wrapping/grips on them. These changes affect your stats of strength, luck, cooldown, runic power, defense and vitality with different gear having certain trade-offs. One axe pommel might increase your strength and vitality but also bring down your luck. While another might have sockets for you to slot gems into but also lower base stats. Gear also can have perks attached like granting “low perk activation to grant blessing of Runic on any kill,” or “high perk chance to grant health burst on any Executioner’s Cleave.” So, not only do you have to balance gear stats, but you have to weigh out gear perks. 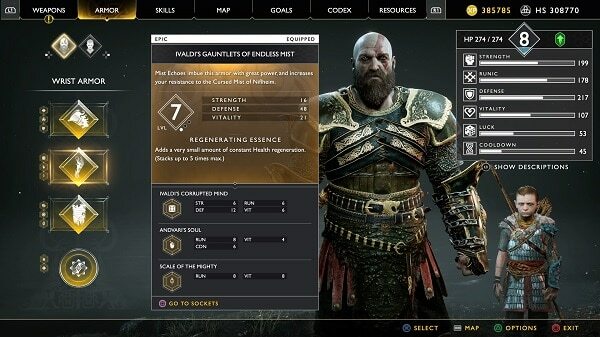 Finally, Kratos has a level that is associated with gear. You don’t actually get experience points or level up like a usual game. The way you level up is by equipping higher-level gear. There’s no level requirement for what you can have either. It’s just a matter of finding or crafting a stronger item with a bigger number. You can also upgrade the gear you have equipped two times with various gathered resources. Unlocking moves from the upgrade tree isn’t the usual fair. It’s tied to your axe/blades level, and these are upgraded mostly through story beats. Beat a huge, unique boss? You’ll typically get the materials needed to upgrade the axe or chains. You actually unlock new moves by just buying them in the menu. There’s a quick video of how the move looks or what it actually does. There aren’t a ton of moves to unlock, each tier (of five) only has three or four moves in total. Most of the new moves I never really used much either, instead, I focused more on the Runic Attacks. You can also equip different talisman and runic enchantments. These are activated by holding L1 and pressing an attack button (light or heavy), or circle. Talismans are generally more defensive focused. They also can provide a bit of healing, slow down time around you for a few seconds, or prevent enemy attacks from interrupting your own. Runic attacks fall into the light and heavy variations per your two weapons. These typically fall into four different classes: melee, area, ranged or aimed. It’s pretty much at your discretion on what you want to use. Each attack can cause different status effects or damage. Each attack also has stats and can be upgraded (with materials) as well. Finally, Atreus himself also has runic summons that you can use. These attacks summon various ghostly animals to attack enemies or aid you. These include a pack of wolves, a boar stampede, attacking crows, or a bitter squirrel that can dig up health stones for you. The actual formula of God of War is highly reminiscent of the 2013 Tomb Raider reboot. Both games are open world-esque, you do have a story quest to follow but you can usually abandon it to do side content. There are collectibles to gather, side quests to do, new areas to explore, even languages that you gain more proficiency at by collecting stuff in the game world. Alternate paths, treasure chests, and hidden places also open up the further you play, especially with a few key upgrades. It’s not exactly a Metroidvania but it has some of the same spirit, with the game gating your progress until you have specific abilities unlocked. Once you beat the game you are plunked back into the world where you can collect anything you missed. Of note, there are two more after-game activities you’ll want to do, one is a battle arena with levels and another is a series of random battles where you are poisoned as you spend more time there. In a word, no. Some older fans might be turned off with this iteration of Kratos. Especially now that he has a personality. But I’d say those are the same cretins who got upset over Dante’s redesign in the DMC game over prior Devil May Cry games. Honestly, if I have any complaints, they are minor. Probably the biggest one is that the map is kind of a mess. It has limited categories for finding stuff, you can’t zoom in well, and you also can’t put notes on it either. It would have been great if it used a similar map that Tomb Raider did of actually marking off areas of interest that you found, but can’t access because you’re missing gear. Also, the gear upgrade system can be kind of strange at times. It’s not bad but it is odd. You’ll frequently be missing materials to upgrade a piece of gear you may like. Instead, you’ll have to consult a guide to find out where the hell Aesirbane is, or how you can get more than three Dragon Tears. The game offers you no help for finding most of this stuff and with at least 25 different resources to collect, it can be kind of annoying when you need five Perfect Asgardian Steel and you’ve only found four so far. These problems and the one I mentioned above about the tight camera are all pretty minor in the grand scheme of things. I was frankly amazed at how great this game is, even if I had to do a few Valkyrie fights over 20 times, I enjoyed myself all the while. 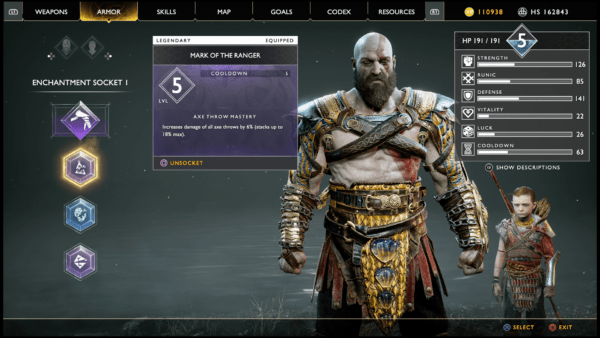 Overall Score: 10 Out of 10 God of War is a game that appeals to anyone. 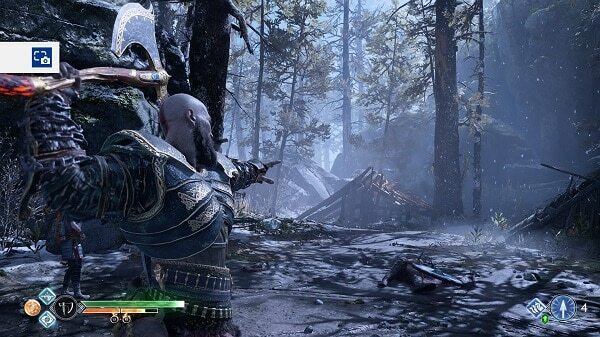 It has the usual visceral action of a prior God of War game. However, only now it has an actual story and great characters driving things along. The Leviathan Axe is an incredibly fun weapon to use and the combat remains rewarding as the game goes along. 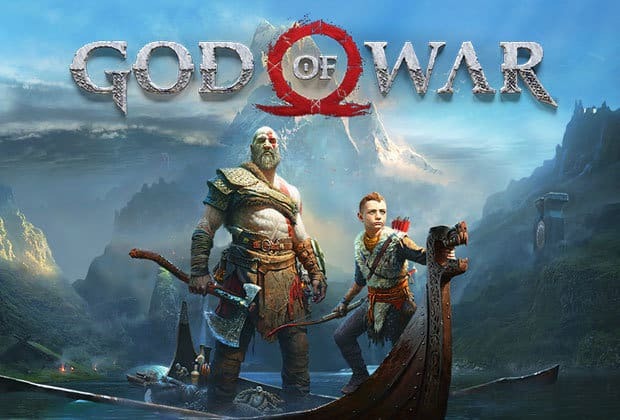 Other games, notably NieR: Automata, might have a more thought-provoking narrative but pound for pound, God of War is the best action game on the market right now.